"Boasts precise controls, an LED display, and a large hopper." "The automatic feed system makes this easy to use." "An affordable option for those who are ready to upgrade their smoker." "Monitor your meat from your Apple or Android smartphone." "It’s like a grill and a cast iron pan at the same time." "Has an easy-to-use digital controller to keep the temperature consistent." "The legs fold so the grill takes up less space in storage or in the trunk." "Made for those who are serious about their grilling." 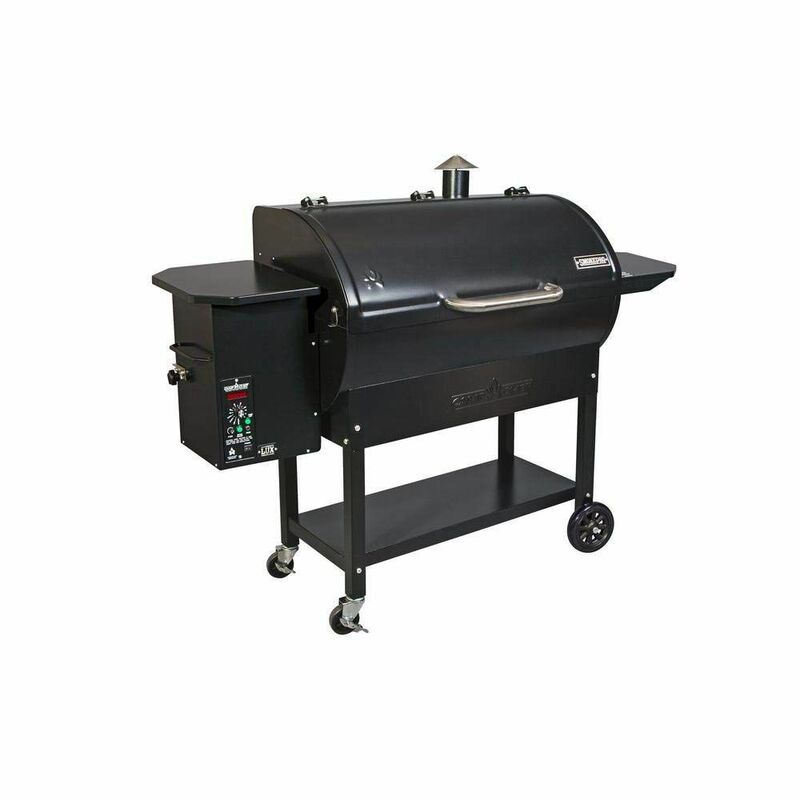 Home grillers will love the features of this updated pellet grill and smoker from Camp Chef. The LED display lets you monitor both the internal temperature of the grill with the integrated thermometer and the internal temperature of your food with the stainless steel probe, so your food will always cook perfectly. The total cooking area is 875 square inches including both the grilling area and the warming/smoking rack, so you’ll have plenty of space for racks of ribs, slabs of bacon, or enough chickens to feed the neighborhood. Meanwhile, the grill precisely controls the temperature, so you won’t have wide temperature fluctuations that can ruin foods. The hopper holds 18 pounds of pellets, which means that you'll have a longer period of time for cooking. The automatic feed system makes this grill just as easy to use as a gas grill. You can control the heat simply by turning a dial to select a temperature from 180 to 450 degrees. The grill will maintain that temperature to within +/- 20 degrees for consistent cooking. The main cooking rack is 513 square inches while the smoking/warming rack holds an additional 187 square inches, so you’ve got plenty of room for grilling burgers, steaks, chops, ribs, and vegetables to feed a crowd. For easy cleaning, a spigot drains the grease neatly into a cup (not included) so it won’t accumulate at the bottom of the grill. The grill body is coated steel and the lid is stainless steel. A generous closed cart gives you plenty of space to store pellets and cooking supplies. The hopper on this smoker holds 20 pounds of pellets; a 20-pound bag of oak pellets is included, to get you started cooking right away. Because of the technology involved pellet smokers are never inexpensive, but this model is priced so it's affordable for those who want to move beyond grilling and experiment with a smoker. It offers 742 square inches of grilling space with 550 square inches of main cooking space and 192 square inches of secondary space. The foldable front shelf gives you room to load and unload the smoker, even when you’re wrestling large briskets or giant racks or ribs. The grill body is made from powder-coated steel that can withstand tough weather conditions while still looking attractive. The cooking grates and warming rack are made from porcelain coated steel. An integrated temperature gauge and digital controller complete the package. The hopper holds 10 pounds of pellets. Tailgating is easy when you can control the grill from your Apple or Android smartphone and monitor the cooking process without lurking over the grill! The Green Mountain Davy Crockett Wifi Pellet Electric Grill not only allows you to remotely monitor the grill temperature, but it lets you check your food, set a timer, and receive push notifications on the status of your food. A metal mesh side tray with utensil hooks gives you a convenient spot for tools and sauces as you cook on this compact grill. It has 219 square inches of cooking space and is lightweight enough to move around when you need to. The legs fold open and closed, so you can store it easily when it’s not in use, saving you space on the deck or in the back yard. Plus, the hopper holds 9 pounds of pellets. This pellet grill has a unique feature that makes it great for direct-heat cooking: the flame broiler slide-plate lets you control the amount of flame that reaches the food from below. It’s like a grill and a cast iron pan at the same time. Meanwhile, the electronic ignition gets the grill started easily and fan-forced air creates clean flavorful smoke. This offers 700 square inches of cooking space on porcelain coated cast iron grids that won’t rust or corrode, while they also produce excellent grill marks. The burn system is digitally controlled for excellent temperature control and even heating from 170 to 600 degrees. Because of the innovative design and exhaust system, the upper rack gets hot enough to use for grilling, and not just smoking or warming. Shutting the grill down is just as easy as starting it. When you press the power button, it waits for a proper cool down before it turns off completely. The hopper holds 18 pounds of pellets. Traeger grills are beloved by professional smokers, but this one is simple enough for beginning smokers. The digital controller keeps the temperature within +/- 20 degrees for consistent cooking just by turning a simple dial like the one on your oven. You can set it from the low-and-slow “smoke” setting, up to 450 degrees for grilling, baking, and more and the LED display lets you check the grill temperature as often as you like. This offers 380 square inches of cooking space on porcelain coated grates, and starting the grill is simple, with an electronic ignition that is controlled with an on/off switch. Your grilling tools will be safe in the tool caddy, along with sauces and seasonings, while the front rack gives you space to work and to load unload the grill. The hopper holds 18 pounds of pellets. When you want to take your grill with you, this one is easy to pack. The legs fold so the grill takes up less space in storage or in the trunk of your car, and rollerblade-like wheels make it easy to move. It also includes extras you’ll love, like the grill cover, grill pad, 80 pounds of pellets, and an instant-read thermometer to double-check your food. When you don’t want to lurk near the grill, you can use WiFi to monitor the grill temperature and the two integrated meat probes. The cooking chamber is all stainless steel, so it won’t corrode or rust no matter the weather, and you’ll get 340 square inches of cooking space on stainless steel cooking grates. If you need extra space, a shelf is available for purchase. You can set it for temperatures from 200 to 500 degrees in 5-degree increments, and when you’re done cooking, the cool-down mode is just one button-press. This also has a low setting that cooks below 200 degrees for extra-high smoke output, or you can set it for high heat above 500 degrees. The locking stainless steel hopper lid can hold a large platter or dish as you unload the grill, while it also keeps pellets safe and dry. The bullhorn handles give this grill a unique look, and the hopper holds 15 pounds of pellets. This grill is perfect for folks who are serious about grilling and smoking. Traeger is known for their quality grills and this model doesn't disappoint. Made in Oregon, it has a digital controller for fine temperature control, and it’s just as easy to use as your oven. The only work you need to do is set the temperature, then the grill gets busy. An auger feeds the pellets from the hopper to fire pot where they ignite to create heat and perfect smoke, while the grill’s design creates convection cooking for perfect grilling, smoking, baking, and more. This has 589 square inches of grilling space on 3-piece porcelain-coated grates that are easy to clean. Outside the grill, sturdy stainless steel shelves give you plenty of space for sauces, rubs, and tools, and for loading and unloading the grill. Enclosed storage space under the grill gives you plenty of room to store pellets, tools, and supplies. The hopper holds 18 pounds of pellets. Our writers spent 5 hours researching the most popular pellet smokers on the market. Before making their final recommendations, they considered 15 different smokers overall, screened options from 10 different brands and manufacturers and read over 24 user reviews (both positive and negative). All of this research adds up to recommendations you can trust.